What Are the Health Benefits of Almonds, Pecans & Walnuts? Will Olives & Nuts Help to Reduce Belly Fat? Nuts, especially raw almonds, make a delicious and healthy snack. They are rich in vitamins, minerals, protein, healthy fats and antioxidants. The American Heart Association recommends consuming four servings of nuts per week for the best health benefits. Keep raw almonds on hand for a healthy energy boost. A small handful can help you avoid an afternoon energy slump. Replace croutons and full-fat cheese in your salad with a handful of raw almonds. Add a few almonds to yogurt or ice cream for a healthy crunch. Adding raw almonds to your diet will yield many health benefits. Raw almonds are filled with healthy fats. While they do contain a small amount of saturated fat, most of the fat in almonds is monounsaturated fat, which is known for its ability to promote healthy cholesterol levels and cardiovascular health. Nuts play a role in decreasing cholesterol levels, especially when you eat them instead of less healthy snacks like potato chips or cookies. Harvard Medical School indicates that cholesterol benefits are even greater when you combine nuts with other healthy foods. Harvard states that men can reduce the risk of experiencing a cardiovascular event by regularly eating nuts. Almonds make a great snack because they are a good source of calcium, magnesium and phosphorus. These nutrients are essential for keeping your bones and teeth healthy and strong. Just 1 ounceof nuts contains 8 percent of your daily intake of potassium, 20 percent of the recommended daily intake of magnesium and 14 percent of the phosphorus you need. A deficiency of these nutrients can cause osteoporosis, while an adequate intake prevents this degenerative bone disease. Magnesium is especially important for bone health because it helps to regulate the levels of calcium and vitamin D.
Including raw almonds into your healthy diet may help you prevent weight gain. 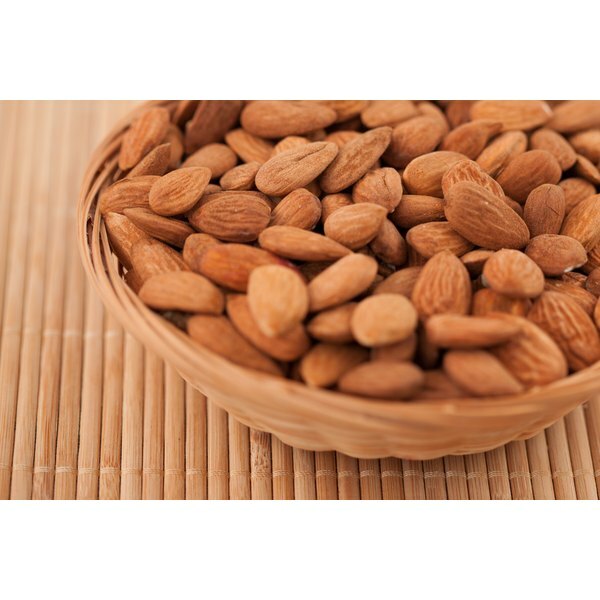 Almonds contain three total grams of dietary fiber, with 0.5 grams in the form of soluble fiber. Fiber may be beneficial in controlling your weight because it helps to keep you full between meals. Insoluble fiber keeps your bowel movements regular, and soluble fiber forms a thick gel in your intestines that helps keep you satiated. The fat and protein in almonds promote satisfaction as well. Keep your snacking to a small handful per day, however, since too much fat and calories can cause weight gain. Will Eating Raw Almonds Cause High Triglyceride?